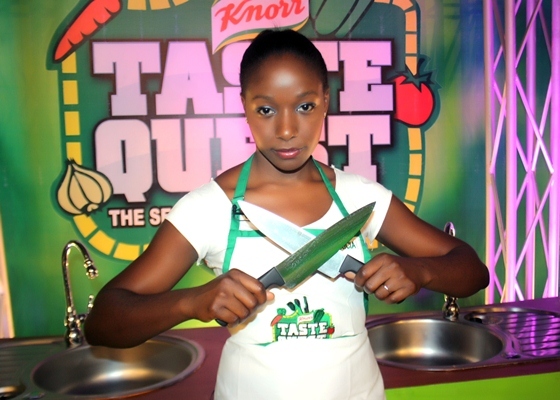 After the first elimination during last week’s show, another eviction has occurred on Knorr Taste Quest; this week, the heat burnt out Mercy Peter. The judges’ verdict was that her meal was very disjointed. The winner of this week’s task was Patricia who made a dish of Pasta with Tomato-Cream Base and Rum Ice-cream with avocado pecan topping, and her presentation was great as she used water leave for the garnishing. The secret ingredients for this episode were Avocado, Mozzarella Cheese, Beef Fillet, Baby Prawns, and Pecan Nuts to make a two course meal. The format of the show is not about the contestants coming to cook Egusi or Jollof Rice on the show, not that there’s anything wrong with that, rather it’s about coming up with great dishes using everyday ingredients. The show is to be commended for that. For every episode that has been shown so far, the judges have given the contestants ingredients you would not originally think of, but at the end, it gives you great ideas on how to use all the ingredients together. Personally, I can’t wait to try out this combination; Baby Prawns and Fish Fillet, that’s like using fish and meat, yummy! You all should check out the recipes from the contestants on www.facebook.com/knorrnigeria. The winning recipe is also always highlighted. 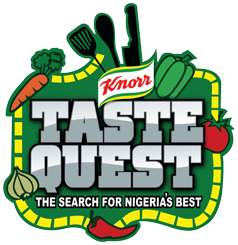 Knorr Taste Quest shows on the following stations; Silverbird on Saturdays at 8.30pm, AIT on Sundays at 5.00pm, Galaxy on Sundays at 8.30pm, E-Stars (Startimes) on Sundays at 7.30pm and OnTV on Sundays at 6.30pm. You can also watch previous episodes and auditions by clicking on this link,www.youtube.com/knorrnigeria. Prizes worth Ten Thousand Naira could also be won by answering the questions asked during the show. I've always loved and used KNOrR but this show is simply a copycat of other foregin cooking shows like Top chef, Master chef, Chopped and Iron Chef.....you're sure to find more 'original' shows watching FOOD network on cable than this....but I commend them for exposing it to Nigerians sha, it's bound to inspire and challenge people. Did somebody say Ibo pple don't know how to cook...chai! I laugh in Zion. U miss road o.
I can see u r an agent of d devil and u don't like peace!!!!!! I see u want to start another tribal war but u won't succeed!!!!! You obviously do not know how tasty and well prepared food should taste that's the reason for your erroneous conclusion. Itaik u stupid no be small ,how can u say eastern. Nija and ibos can't cook,tell me people dat can cook,na people like u cook with maggi ajinomoto,ewuu gambia. See ur life. Ofe nmanu people. Mtcheeeeeeew. Such a stupid and ridiculous generalisation. I am not from the east, matter of fact, I'm from the south, but I think the "igbo people" comment was cheap and offensive. I think they should work more with simple ingredients so that these shows will be of benefit to the average Nigerian trying to make 'out of the box' meals. italk u must b very stupid 2 say that. Am sure ure one of those who cannot even mak a cup of tea. y dnt u com out nd show us ur culinary skills instead of stupidly generalizing nd kolin d easterners bad cooks. Abegi Sharrrrapppp!!! Who told u igbos don't know how to cook. I'm so sure you pant after their food. Linda this ur blog is often patronized by tribalistic ignorant people...why? Shut up! Why re u generalizing.can u cook ? @ Italk, how can u say ibo/eastern ppl don't know how to cook? Where hv u been? R u not aware of how rich and vast ibo dishes r? Where r u from sef??? Easterner's with their smelly food. Biko mere nu Italk ebere.....lmao. The idiot that said Nigerians copied this show...am watching you in 3D. I'm just laughing........the only truth I know is that I have never tasted another tribe's meal since I was born. I will need a lot of motivation to do that and Each time I see ewedu, I fall sick. Yes! I'm proudly Igbo. I think this is a very good show. They have used ingredients that are available in our supermarkets, and the contestants have worked very well with the ingredients.